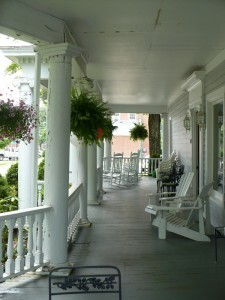 Built around 1835, The Jefferson Inn has maintained its timeless features, now coupled with modern amenities. The house has been beautifully restored and furnished with antiques and reproductions. Relax in the elegant living room around the inviting fireplace or rock in a chair on our wrap around porch and watch the town go by! For those needing relief from a day of strenuous activity, a hot tub is available on the back porch year round to soak away your aches. 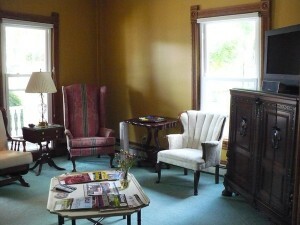 There are two sitting rooms in The Jefferson Inn to socialize with other guests or friends. 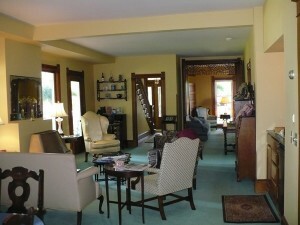 In the main living room you will find a gas fireplace along with couches and easy chairs. A wet bar has been set up for your enjoyment. Complimentary tea, coffee, water and soda pop are available along with a daily home-baked sweet. A refrigerator is available for your use along with barware and serving dishes. The second sitting room on the main floor doubles as a TV and game room. DVDs and games can be found in the converted antique sideboard. Choose to stay at The Jefferson Inn in a bed and breakfast room or in one of our efficiency suites. The B&B rooms, located on the second floor, include four tastefully decorated bedrooms and one luxury suite inviting you to experience both comfort and convenience during your stay. Each room is furnished with a combination of period antiques and incredibly comfortable beds and mattresses. 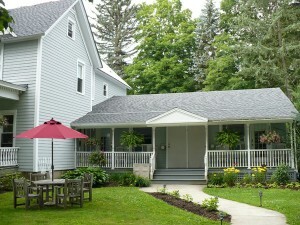 Efficiency units are located at the side of the Inn overlooking the garden. These units are perfect for guests requiring additional privacy or for those traveling with young children and pets. Both have private baths with showers, sitting areas, kitchenettes, televisions and telephones. You can enter these units privately from the Inn’s covered porch. All rooms have private full baths and access to free wireless internet. 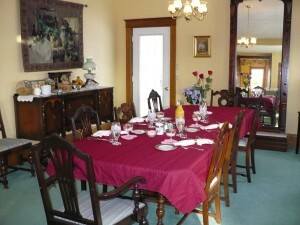 Full gourmet breakfasts are served to those staying in the B&B rooms. Our hot tub and outdoor porches are available for your relaxation. 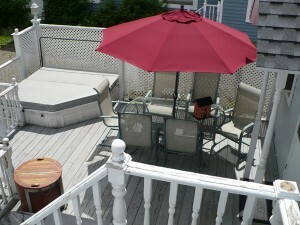 The hot tub is located on the back porch and is open year round. There are several porches for your use. The wrap-around covered porch has rocking chairs along with an antique wrought iron table and chairs to chat with friends, read a book or sip on a glass of wine. Perhaps a game of croquet is in order. You’ll find a croquet set on the wrap-around porch. The efficiency units have their own porch with wood high back chairs. Just off the porch is a picnic table and chairs with a market umbrella to keep you in the shade. The back porch has the hot tub along with a table and chairs and shade umbrella.